The book Blue Ball Syndrome: Why Ordinary People Become Sexual Players is a book that addresses the need that most people have for intimacy, satisfaction and sexual gratification in our relationships. This is the common thread that most people seek in a new or existing relationship. This book reveals why people that are in good or stable relationships may want to look outside of that relationship for multiple reasons. The book is based on a 3 year study talking with married couples, divorced persons, singles and even prostitutes and clergy. This book has all you need to know about what makes us all susceptible to the human passionate touch of sexual intimacy and the controversial infidelity traits of both married couples and even those in relationships. This book will inspire you to keep the passionate flame of what you have in your life or give you the motivation to date again and get prepared for someone new in your life. Don’t miss this great new controversial and passionate view of why ordinary average people and not just celebrities, politicians and sport athletes do innately crave and often become Sexual Players. Get the book, “Blue Ball Syndrome Why Ordinary People become Sexual players”. Join the passion of the conversation today. 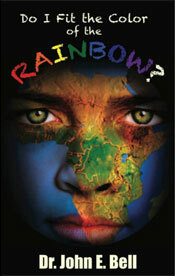 In the book, “Do I Fit the Color of the Rainbow?” the reader will find a great book that reflects the existence of every day human life, often referred to as the Color of the Rainbow of thought. This concept evolves from a professional African-American male’s perspective, which is quite engaging and incredibly honest about life’s challenges and blessings. The book shows a unique insight on topics from the cultural trends of African-Americans to what’s going on with relationships considerably marriage/divorce from an urban stand point. Dr. Bell intimately allows the reader to be ringside while experiencing a family in the Internal Mist of situations and dares to ask, what would you do? Incredibly, the reader gets a great sneak peak inside the men’s locker room to hear what frustrates men with relationships according to a 3-year study performed by Dr. Bell. Don’t miss this great book of American urban fiction with a twist of reality truth as only the mind of author Dr. John E. Bell can present it. The story about Jeremy is a great story that will inspire all children at ages 9 and up and even adults as well. This story takes place in a young boys life as he decides on what he wants to do with his life. Jeremy is from a disadvantaged background and takes notice of many negative images around him but he has a great mother and a loving home life that motivates him to want more in life for himself. Jeremy loves the health shows on cable TV and really wants to become a Physician or someone in the health care field that he admires on the weekly discovery health shows he enjoys so much. One day by pure coincidence Jeremy has a unique accident and Jeremy is taken to the hospital. It is here where he lives through everything that he has seen on TV and meets the people that will forever change his life and certainly will make an impressive impact on his future. Do not miss this inspiring and heart felt story based on real life events about a boy named Jeremy from humble beginnings that gets more than a medical treatment from his accidental fall. Jeremy gets a mentorship that will inspire him to achieve his goals throughout life. I hope you enjoy and are inspired by this book to encourage our children to excel and achieve in school by believing in themselves for positive goals that can be achieved. 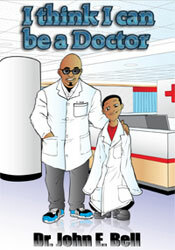 This can happen when our children can be mentored to believe that they too can say, “I think I can be a Doctor”. About Dr. John E. Bell: Dr. John E. Bell is a Surgical Podiatrist and former University part time Professor at Strayer University in Memphis, TN. Dr. Bell received his Doctorate Degree from the Ohio College of Podiatric Medicine and his Master Degree in health Services Administration from Strayer University in Memphis, TN. 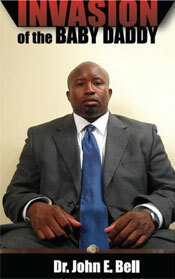 Dr. Bell lives in Memphis, TN and has 4 medical offices where he is CEO of Excelsior Podiatry Clinic PLLC, an accredited business with the Better Business Bureau (BBB) of Memphis, TN. Dr. Bell has been on numerous TV shows including: Fox 13 news Good Morning Memphis , Fox News in Baltimore, Maryland WBFF, I have been a guest on the Ion media network TV Channel show with Tanya Dallas-Lewis in Fairfax, Virginia. I have a current commercial on NCR 24 hour news channel WREGTV Memphis. I have been on the Jiggy Jaguer radio Show, and on the Georg and Nakisha Blog talk Radio Show, The Jay Blog talk Radio Show as well. I have been a guess on the Rev. Jesse Lewis Radio Show as well. I have been a guess on the Prison World Radio Show. EVERY UNWED MOTHER’S NIGHTMARE COMES TO LIFE IN THE PAGES OF INVASION OF THE BABY DADDY, a compelling and moving debut novel that echoes the emotional and cerebral frustrations of unwed mothers throughout the ages. Its unforgettable characters and authentic story line are interwoven with current and real facts about the volume of unwed mothers in our society today. In the story, Dr. Sands believes he has found his perfect mate only to discover that she is pregnant from a previous relationship. Not fully aware of the ramifications of this colossal news, Dr. Sands and Rachel date via long distance during her pregnancy and ultimately decide to get married. In order to make a life together, Rachel must move to Tennessee to start a new life with her husband. But the Baby Daddy has other plans for them. Determined to make this marriage work, Dr. Sands goes to extraordinary lengths to try and negotiate with the Baby Daddy. Brimming with honesty from the author s own experiences, Invasion of the Baby Daddy comes alive with unique freshness, candor and rich detail.